We continually have conversations with our clients about nutrition. People are often very passionate about the food they choose for their pets. We understand that everyone, veterinarians and family members, have the same goal – to keep our patients healthy. So, it can be a difficult conversation to have when we inform owners they are not doing the best thing for their pet. Why do we continue to have the conversation though? The answer is simple. Because food plays such a large role in the overall health of dogs and cats. Our conversations focus on two aspects: (1) What are you feeding? (2) How much are you feeding? When we deal with these two aspects of nutrition, we can manage a lot of long-term problems. 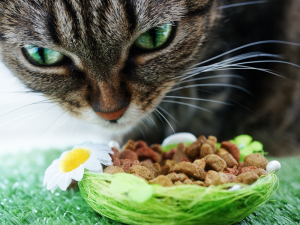 What Kind Of Food Should Your Pet Eat? When we can put all of these factors into an equation, then we can make a better recommendation for you. As we said earlier, the ultimate goal is to figure out how to keep your pet healthy. Nutritional management can be a big factor in managing their health. To help us, please make sure that you know what you are feeding your furry family member before you come to the appointment. Don’t be shy, just let us know. Additionally, there are so many foods out there that we can’t keep track of them all. Please take a picture of your food AND take a picture of the side panel (ingredients and nutritional breakdown). When we don’t recognize the food you describe, then we can use the pictures to help you. Also, we will need to know how much you are feeding. If it’s a “scoop”, please take the time to figure out how many cups of food are in a typical “scoop”.